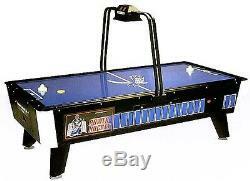 Brand New Coin Operated Great American 8 Foot Power Hockey Air Hockey Table With Overhead Electronic Scoring. This is a commercial air hockey table that has heavy duty blower motor, wood cabinet, strong legs with adjustable feet and long. Wearing play field that provides true and accurate arcade game play. New Looks and Improved Features! Easy to clean Formica play field with long term wear guard finish! Includes overhead electronic scoring bridge with extra bright, extra large digital numbers and play field light! Wide Goals promote super speed action! All around custom over sized Formica rail prevents puck from flying off the play field! All cabinet grade 3/4 plywood! Internal puck drop system, with hinged panel for easy service access at each cabinet end! ABS injected legs with adjustable leg levelers! Industrial rated blower, provides superior speed and performance over any competition! Reliable 5 coin vertical coin system! Center line, goalie box and dramatic graphics enhance premium Formica finish! Specifications: 99" Length, 54 1/2" Width, 65 1/2 Height, 500 lbs. As long as 2 4 weeks especially during peak times between Thanksgiving and Christmas, so please plan ahead. Please note that this product. We apologize for the inconvenience. Front of your home, and you are responsible for receiving the product from the truck. 10 days of initial contact by the carrier. If you are ordering a large item, please note that you may need a couple of people to help unload it and carry it inside. Offer additional services to help move merchandise from the truck into your home or office. At the time you are called by. Please read and follow these steps carefully. If the box has any damage, or if there is any reason for. You to be at all concerned about damage, please write "PACKAGE DAMAGED" clearly on the sheet that they ask you. Only sign for a package if you are sure that the contents are in good condition. Deliveries that have been signed for free and clear of damages will be the receipient's responsibility, no exceptions. Please make sure all of your questions are answered before ordering. Our customer service team is more. Than willing to answer any and all product questions. We are a 45 year old business that has been in the amusement game machine industry. We have a store and warehouse in Madisonville, LA where we service what we sell and work on just about any kind of arcade and home game equipment including jukeboxes, pinball machines, video arcade games and more. The item "Great American Power Hockey Air Hockey Table/Overhead Scoring 8 Ft Coin Operated" is in sale since Friday, June 17, 2016. This item is in the category "Sporting Goods\Indoor Games\Air Hockey". The seller is "moneymachines" and is located in Cranston, Rhode Island. This item can be shipped to United States.